The TSPSC AEO Admit Card 2017 is available for download online at the TSPSC website. The Admit Card/ Hall Ticket for TSPSC AEO 2017 is issued on November 17, 2017. The TSPSC AEO Grade 2 entrance examination is to be held on November 22, 2017. The exam conducting body has not yet confirmed the mode of the examination, as it may conduct Computer-based or Offline OMR based Examination. The Admit card consists of the personal details of the candidate as submitted by them in the TSPSC AEO Grade 2 Application form and the schedule of the TSPSC AEO Grade 2 entrance examination. Get TSPSC AEO Admit Card 2017 complete information here. Latest: The TSPSC AEO Admit Card has been released, download it from the link given below. 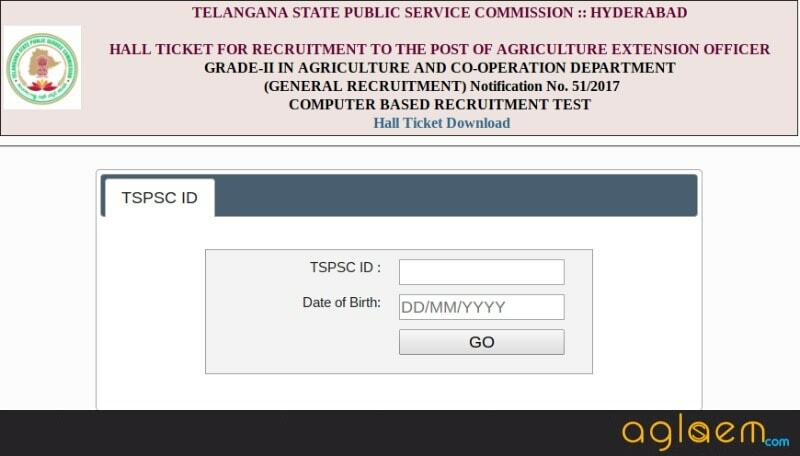 How to download the TSPSC AEO Admit Card 2017? Click on the direct link given above to download the TSPSC AEO Admit Card. Enter the details like TSPSC ID and Date of Birth. After entering the required details, click on “Go” button to submit the details. The Admit Card will be displayed. Download and take print out of the Admit card to bring it to the examination center. A valid photo identity proof in original, such as PAN Card, Driving License, Passport, Aadhar Card, etc. Q. I am not able to download my admit card. What should I do? A. In case the candidate is not able to download the admit card, it is advised to them to at the following Helpline Numbers: 040-23542185/ 87 (Call Time: 10.30 A.M to 1.00 P.M & 1.30 P.M to 5.30 P.M) or email your query at [email protected]. Q. I wish to change my Exam Center. Can I do it now since I have been issued the TSPSC AEO Grade 2 Admit Card? A. The exam center once allotted to the candidate by the Commission is final. Any request for a change in exam center or timings will not be entertained. Q. There is some error in the detail printed on my admit card. What should I do? A. After downloading the TSPSC AEO Grade 2 Admit Card, candidates must ensure that the personal details printed on the admit card are correct, If there is any kind of discrepancy or error in the admit card, contact at the Helpline Number or mail the Commission as per the details given above.